Here we will discuss your hair and makeup needs. We will also schedule your practice session and wedding day services. We recommend booking your wedding services three months in advance. 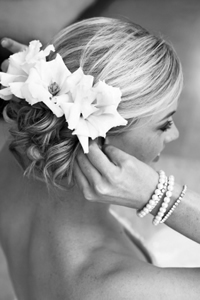 Three to four weeks prior to your wedding we will sit down with you and create the look you desire. Be sure to bring your veil, jewelry, etc so we can have as accurate of a session as possible. We will recreate the look achieved at your practice session. Any and all members of your wedding party are welcome to join you, just be sure to inform us four weeks prior as to how many people will be joining you. Wedding parties booked with six or more guests receive one free bagel tray, champagne and or coffee. All prices subject to change with hair length and style complexity.